As we like to say here, “There’s more than one way to retro.” This circa-1974 St. Charles Kitchens catalog — just added to my personal collection — proves it, yet again. St. Charles trots out their interior design experts and shows one harvest gold kitchen … decorated in six different styles of the day. 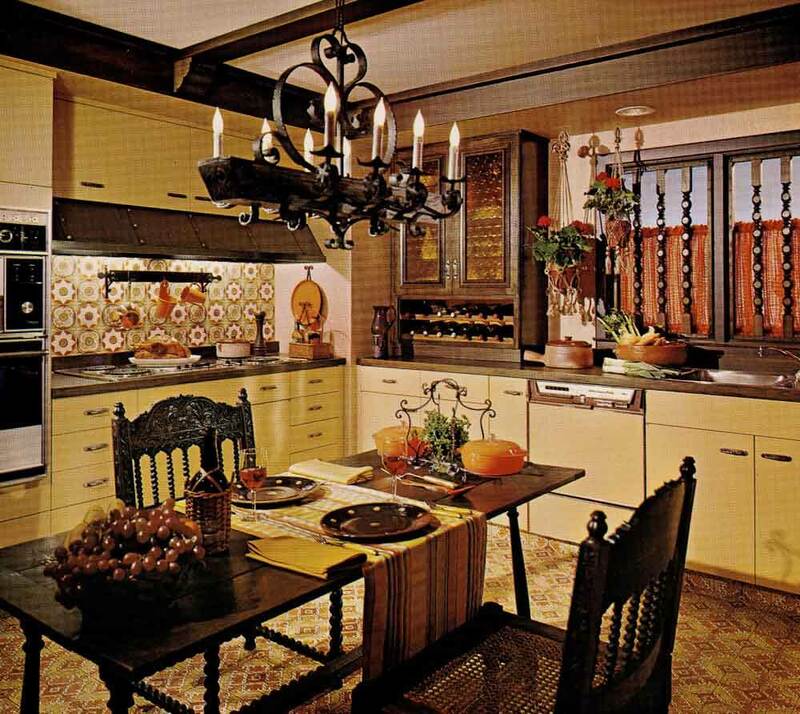 From Early American to Mediterranean to 70s Contemporary — and more — they show us how to get our 70s style cookin’. 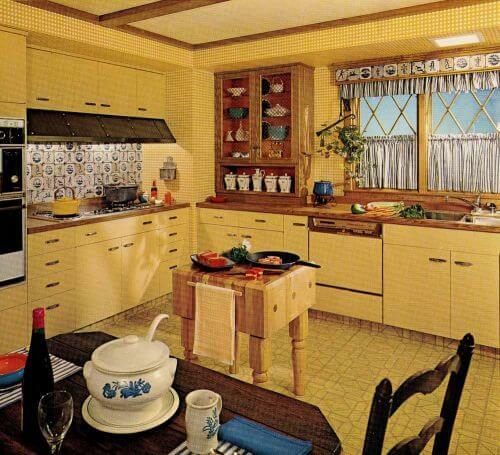 Use checkboard wallpaper, delft backsplash tile and butcher block cabinets to create a Dutch “Country Charm” kitchen. Viewing tip: Click on the photos – they will double in size on screen. Note: There is no date anywhere on my catalog. 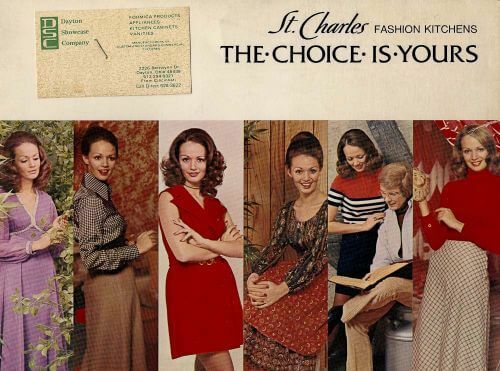 I’m guestimating 1974 based on… the clothing. 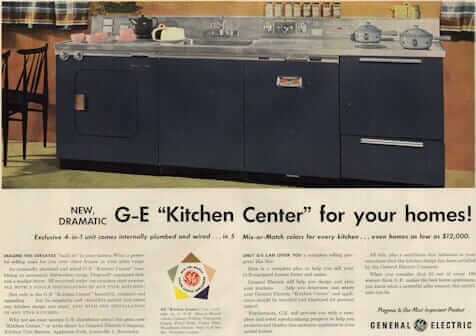 Note: Harvest Gold was introduced to kitchen appliances in Spring 1968. 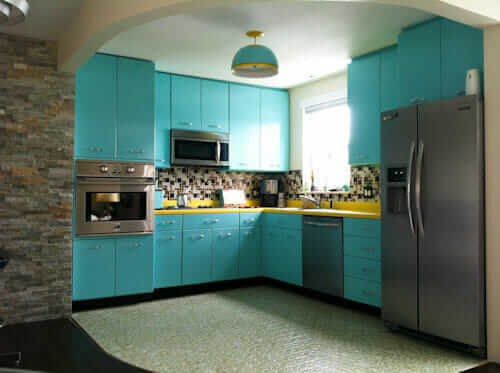 It was one of the longest enduring color trends — popular through at least 1984. 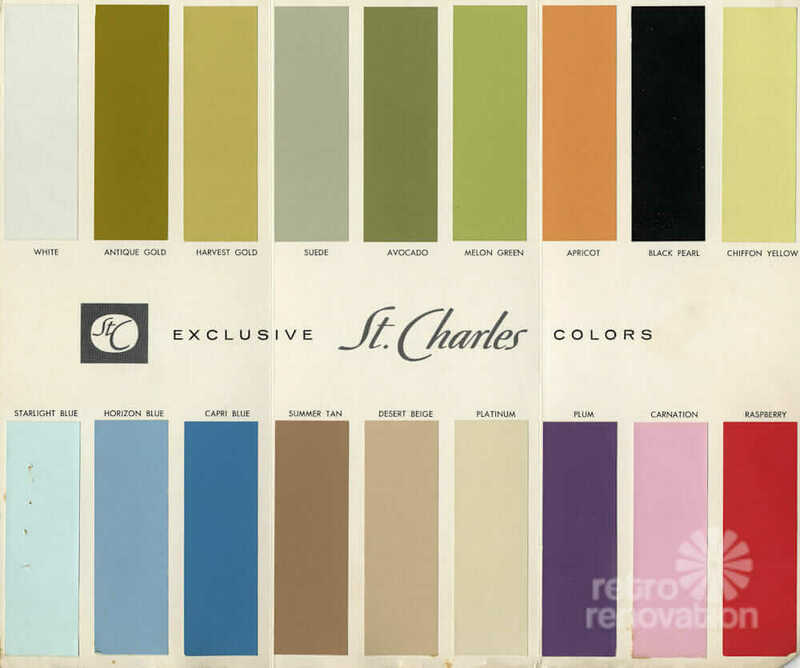 Above: Other colors available from St. Charles this year. 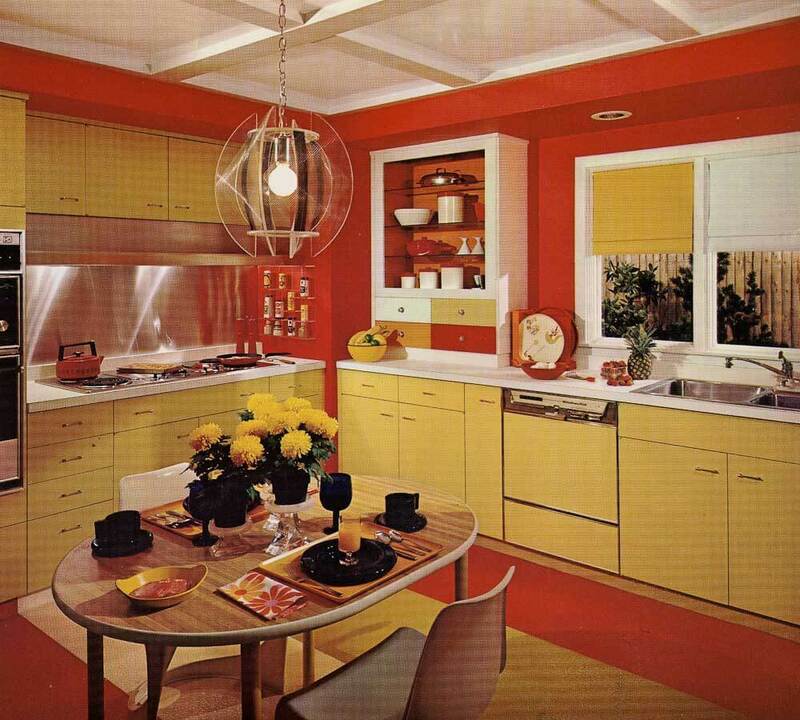 And YO: The cabinets are textured steel, “St. 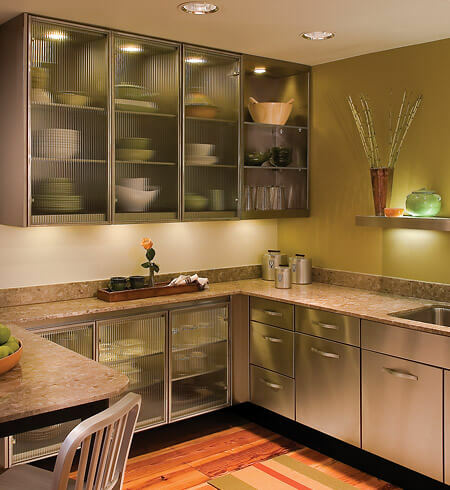 Charles DURALON finish” with a “soft-to-the-touch feeling of fine-grained leather.” Why did steel kitchen cabinets introduce texture to their cabinetry? I hypothesize: To better mask fingerprints and better hide dings. There also may have been a desire to make them appear more organic, less… antiseptic. 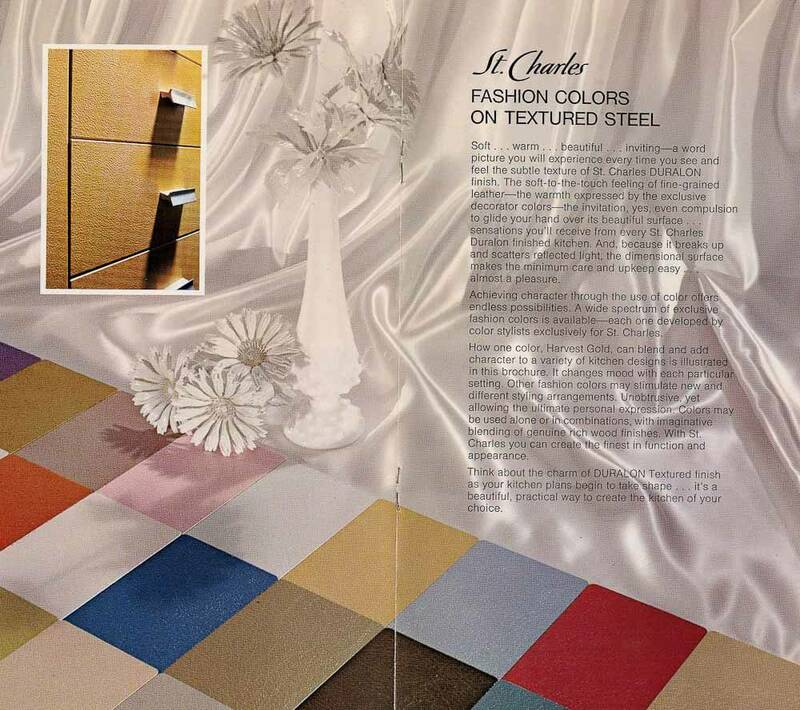 I’ve also talked about steel cabinet maker’s introduction of wood door fronts, too. 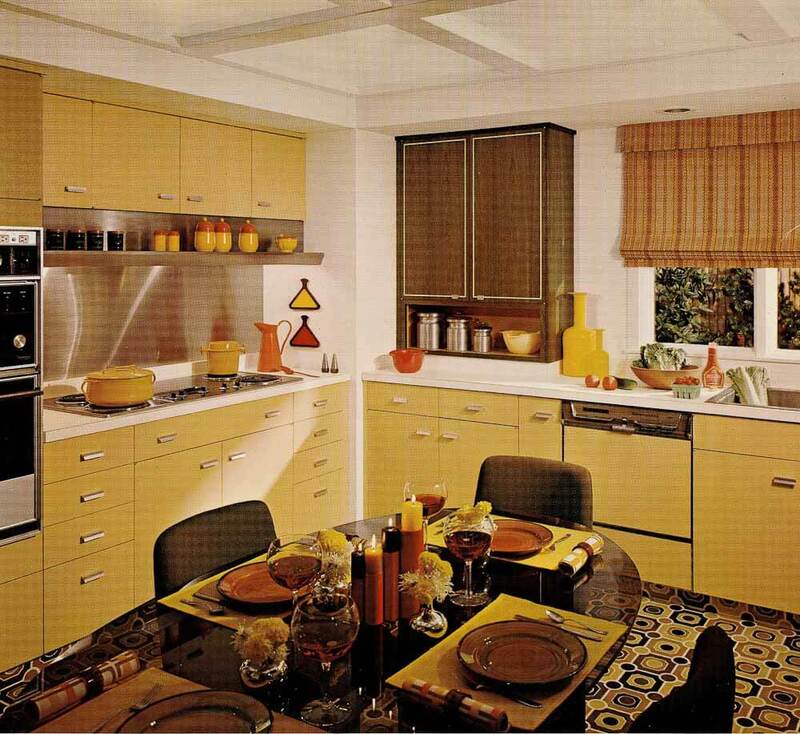 See my History of Steel Kitchen Cabinets — 70+ designs identified so far! And of course, we have the “Spanish Villa,” or as we have been known to call it, the “Casa de Torquemada” kitchen style. Ya gotta love the creativity. 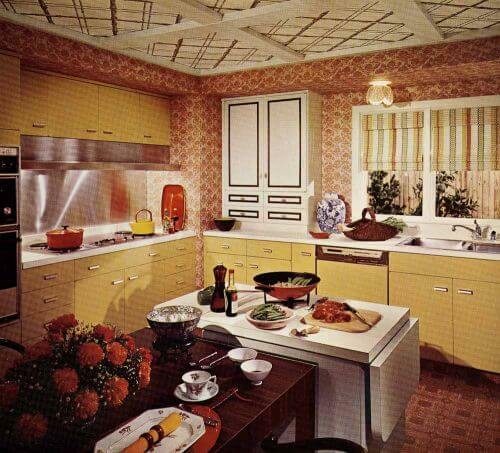 I feel like this “Oriental Influence” kitchen concept is something you’d have seen in Florida. Don’t forget the electric wok! Memories of the 1970s, anyone? Love them all. The 1972 home we just bought has the traditional wood cabinets with “Amerock Carriage House” pulls, so we are going with the Spanish thing, but as a 70s child we had that very shade of yellow cabinets (Formica, not steel). Love the 70s. Aww, when I see these 70s kitchens I think of how angry I am my 60s-era kitchen was gutted by the condo association before we moved in. The 70s flower power kitchen is my favorite, as I had a much-loved great auntie who died way too soon, at 67 about 12 years ago, whose architect husband did that treatment in hers. Funny though how the concept of what was “Mediterranean” in those days was dark & heavy, whereas today it’s lighter and more open, a switch from Spanish design to Southern Italian & Provencal French, or even white & blue Greek. Also funny: other than the wok — an electric one I think — nothing about that redo correlates to what we think of as Asian today. I am hard pressed to pick a favorite! I have to go with #2, #3, and #5. I love the Casa de Torquemada! The floor in #2 is to die for. I like no. 2 Contemporary best. That yellow vinyl floor in nos. 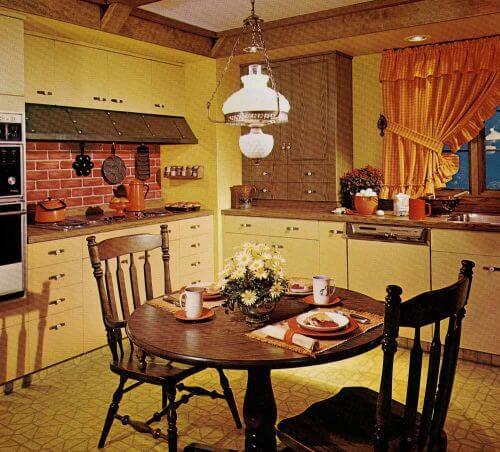 1 & 3 is similar to what was in my mom’s kitchen in the 70s & 80s.